new to the flat are a nice pair of incandescent light bulbs. incandescent bulbs work by running a current through a metal filament. this gets bright hot and in turn produces a natural and very warm light. here, the filament has been hand-stitched into a fantastic spiral shape – all housed and protected in a small glass globe. 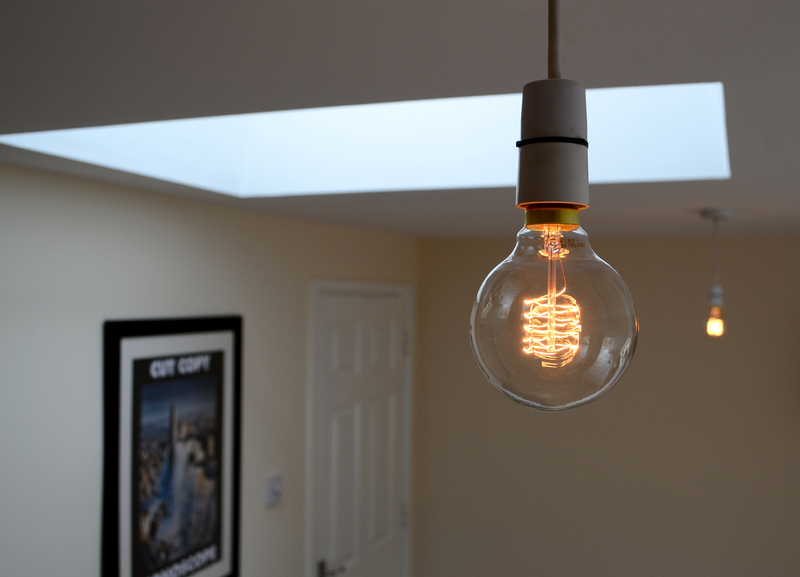 i’ve kept the bulbs exposed to keep things simple and show off this great coil of light. you can get bulbs that have the filament run vertically or zig-zag around the glass but i wanted something a bit more intricate. the bulbs do well at full brightness but (as with all the photos here) they look even better when they are turned right down. using a dimmer switch is recommended to achieve a nice soft glow that’s just as effective during the day. 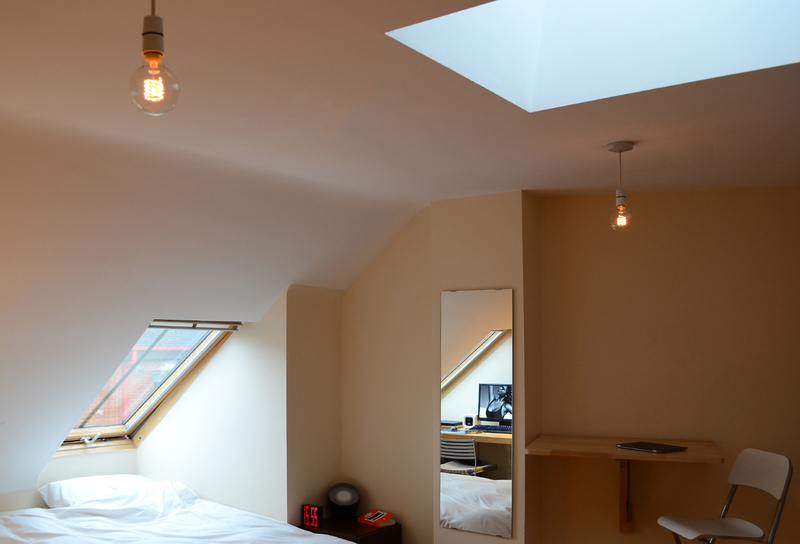 a dimmer also prolongs the life of the bulb and allows a bit more flexibility with the lighting. in normal-use theyre great! but there’s something else i wanted to try out: how do the bulbs work in combination with the colour-shifting properties of philips livingcolors? the effect is fantastic. the two globes of light add dots of character to the room and the colour choices are even more expressive. you can read more about livingcolors in an earlier blog post but it’s worth saying again that it doesn’t turn the room into a rave scene – the colours are certainly bold but never intrusive. it turns the flat into a great space to work and relax. 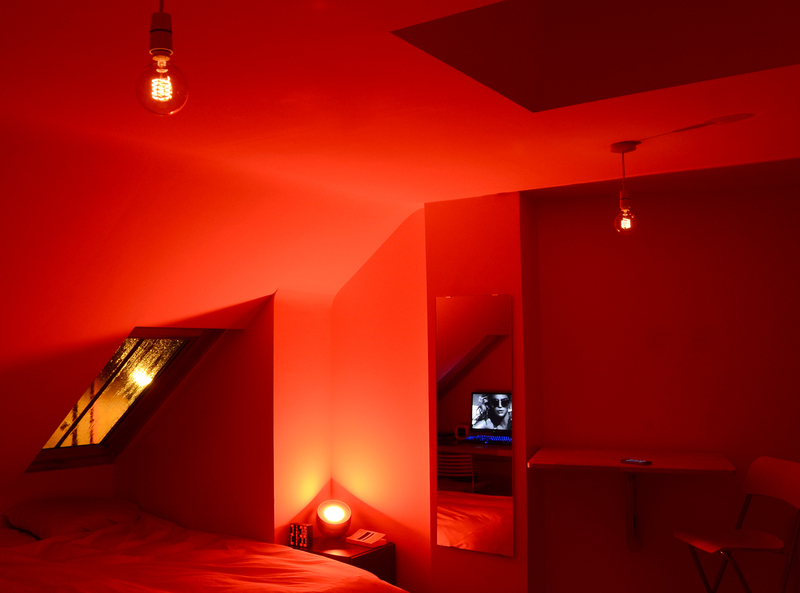 the red darkroom setting may seem a bit excessive but it really warms you up. 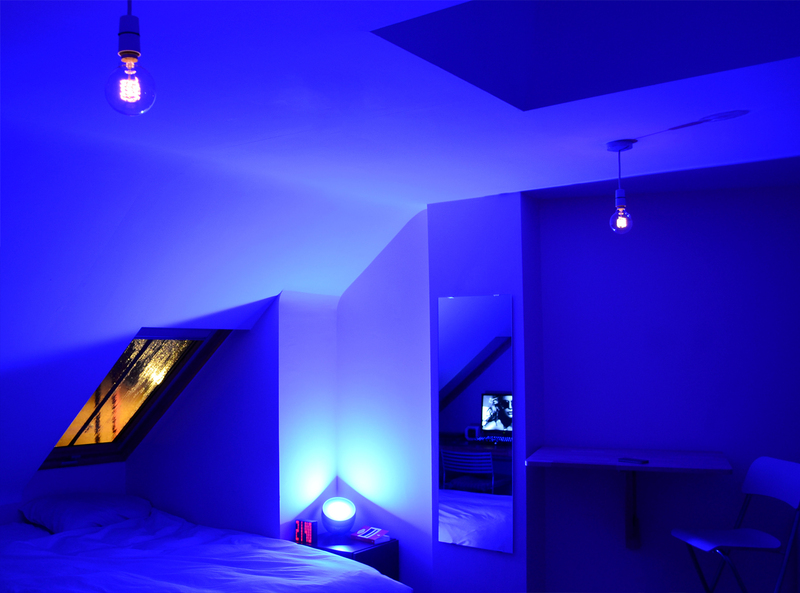 by far the best setting is a solid blue – the bulbs punch right through it, leaving behind a soft glowing orb of orange. the studio is always bathed in natural light as i live in a roof space. but as you can’t change the brightness of fluorescents easily there was always an abrupt change in the room from fully OFF to harsh ON. it didn’t feel great. with incandescent bulbs and a dimmer i can create a much smoother transition as the evening sets in. these two bulbs replace the low-energy bulbs that ive always had difficulty living and working around. yes, they’re cheaper to run with a stronger illumination, but the colour and brightness was far too harsh. i tend to keep these bulbs on low for most of the time. 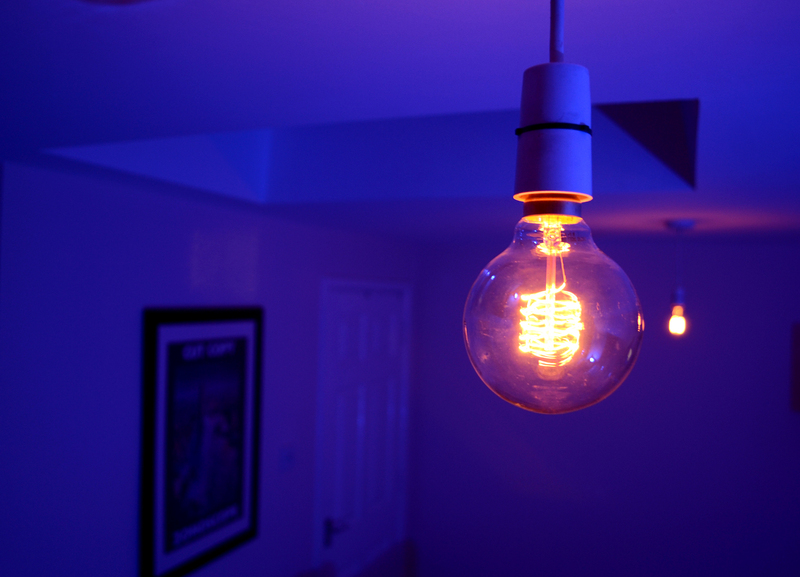 for a few pence extra on the energy bill, these bulbs are far more practical and nicer looking in my small flat than the previous low-energy lights.